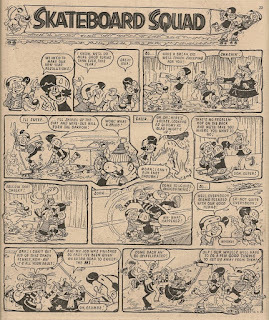 The comic is still suffering fall-out from the industrial dispute that halted publication for 3 weeks in December 1978 - had printing not been interrupted, the previous week's issue would have been the edition welcoming in 1979. However, for reasons explained here, the 09 January 1979 issue was a 'standby' issue and therefore was devoid of any reference to the turn of the year. This edition, with its new year references, had obviously been prepared some weeks prior to its eventual publication (it was probably completed before the industrial troubles at the printers escalated into an all-out strike). 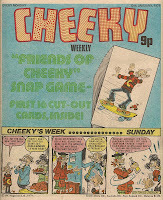 The Cheeky Weekly editor evidently felt that the new year festivities were fresh enough in reader's memories to get away with publishing Cheeky Weekly's New Year issue in the second week of 1979. The alternative option - to hold over this New Year issue until 1980 came around (in the same way that some of the material intended for the aborted Christmas 1978 issue was held over until the following festive season) - was evidently felt to be less attractive. However, I would guess that, had this New Year issue been published a week earlier as originally scheduled, the cover would have made mention of the turn of the year, as did the covers of the comics dated 07 January 1978 and 05 January 1980. 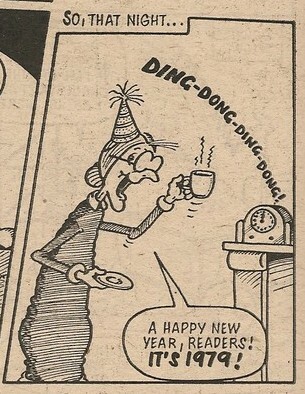 To run this issue with a mention of the New Year on the cover was possibly deemed unwise in case casual comic readers browsing the newsagents' shelves assumed it must be unsold stock from the previous week's edition. This week's cover leads with news of the commencement of yet another cut-out game (the most recent being the Crack-a-Joke game which concluded in the 23 September 1978 issue). This time readers are invited to snip out and retain the first instalment of the Friends of Cheeky Snap Game, which will be running for the following three issues as well. The decision to print the announcement in light green ink on a pale blue background is a questionable one. Meanwhile at the foot of the cover, the toothy funster is unconcerned by such matters, as in the Cheeky's Week…Sunday strip, he and his parents are preparing for their imminent New Year bash . The party gets into full swing on page 2, where Cheeky's dad is blackmailed by luscious Lily Pop into allowing our grinning pal stay up to enjoy the festivities. The party continues onto page 3, where we witness the extremely rare sight of Uncle Hamish after being relieved of some cash. We might have guessed that Spiv would be the one to achieve this awesome feat. independence campaign by The Scottish National Party. Cheeky's dad is rewarded with a smackeroo from lovely Lily (much to Cheeky's mum's annoyance) as the clock strikes twelve. 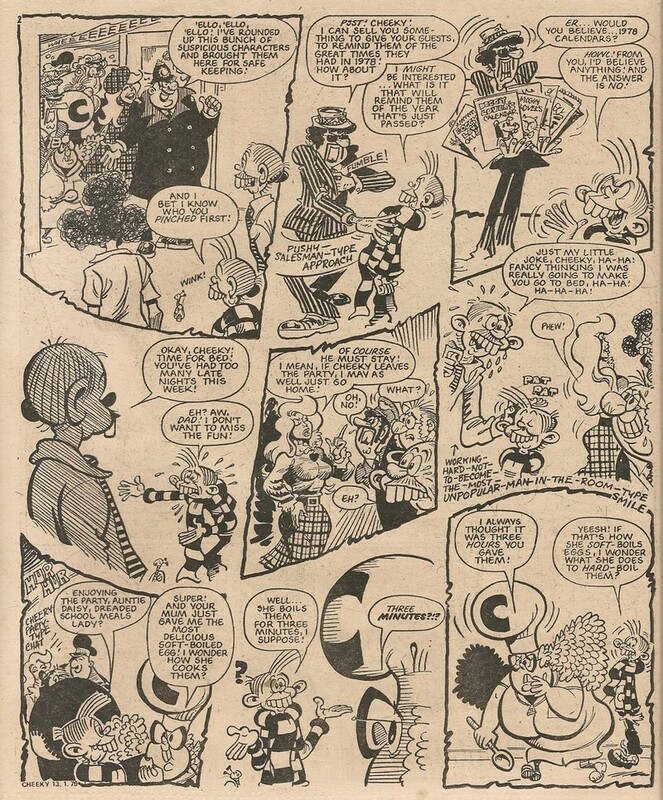 A caption above the first page of this week's new-year themed 6 Million Dollar Gran story explains "There was a special edition of Cheeky's favourite programme on Monday…". 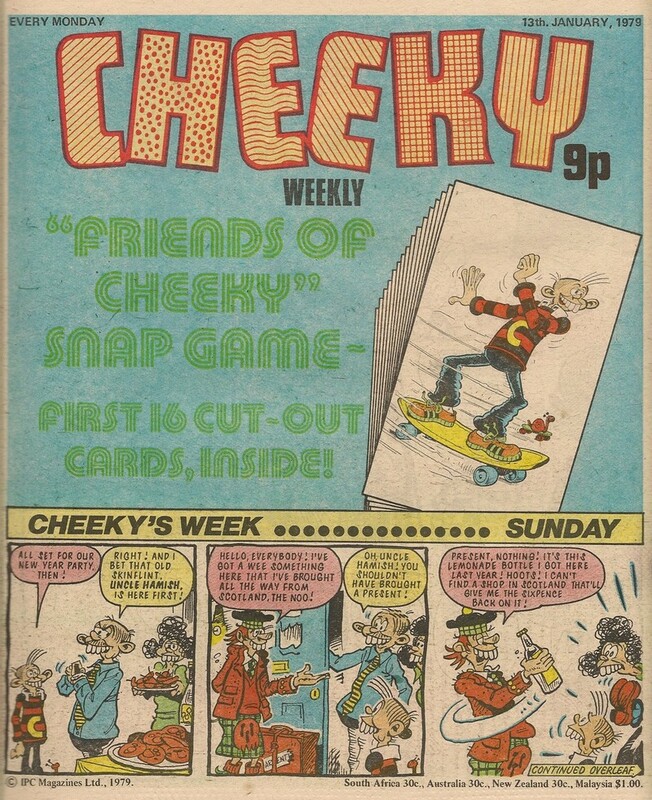 This is fortunate for readers, since on the front page we joined Cheeky on Sunday evening, and as from the 30 September 1978 revamp issue, Gran's TV programme had been moved to a Sunday afternoon slot (because the Sunday evening element of Cheeky's week had ceased the previous week). There is a curious moment in this week's Gran episode where she says "A happy new year, readers". Surely she meant "viewers"? After a new-year's-resolution-based Calculator Kid story, Tuesday sees Cheeky encountering several of his pals whose resolutions are causing much hilarity. This week's Mystery Comic is the first to be without Tub on the cover (or anywhere else, as he's absent this week, seemingly a casualty, along with Why,Dad, Why? 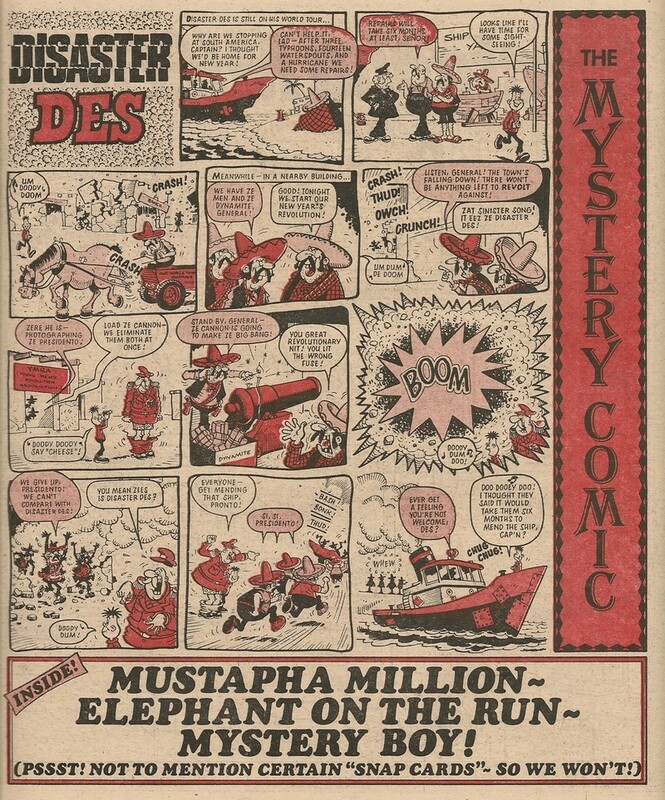 of the intrusion of the snap game into the Mystery Comic's centre pages). Instead Disaster Des gets promoted to the perplexing publication's front page for the first of only two occasions. This week Des exports his particular brand of mayhem to South America, inadvertently foiling a revolution in the process. 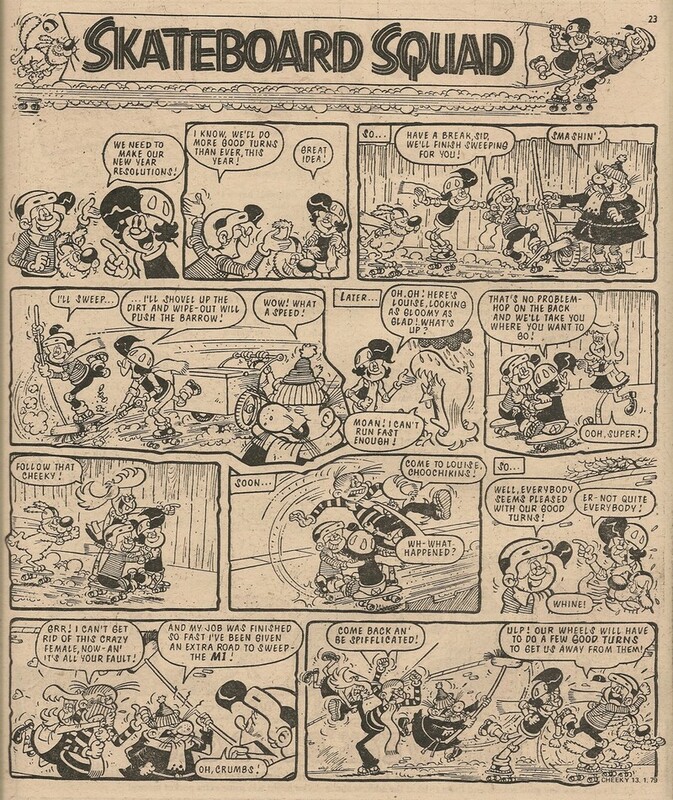 This week's Skateboard Squad strip includes some nice crossovers with characters from Cheeky's Week. The belated new year issue rounds off with a Pin-Up Pal poster featuring noisy nosher Crunching Chris. 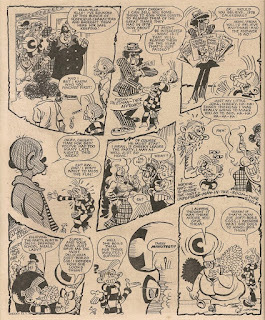 There's pure Frank McDiarmid art on all 11 Cheeky's Week elements this week (we have come to expect all-pure-FM work on Cheeky's Week in celebration issues), plus Frank does the honours on the back cover poster. Yes, this is a nice issue overall - we're lucky that the editor didn't decide to hold it over until New Year 1980. 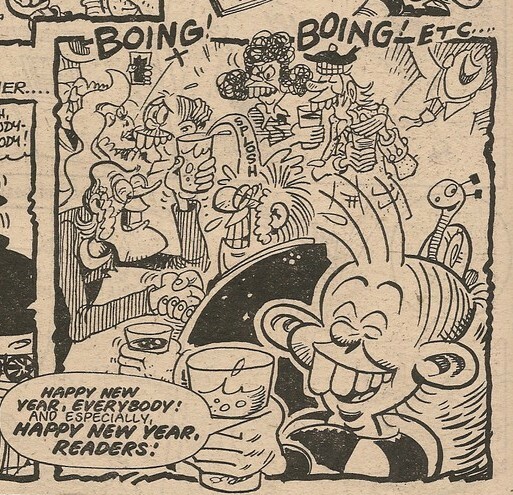 I wonder if the reason the New Year stories weren't deferred like the Christmas ones would be down to the year '1979' being part of the strips - this often happened in comics (whereas there would be no need to note the year in the Christmas stories). 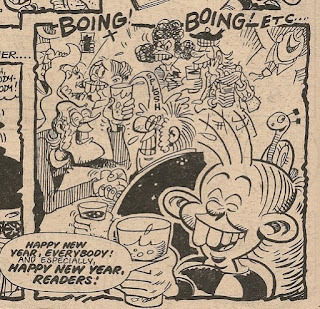 If the art or script already had references to the exact new year, it may not have been worth the bother to hold them over for 1980. Yep,that's a distinct possibility. Or else the Cheeky editor, having (presumably) already paid for the scripts and artwork, wanted to see his money in print as soon as possible!